One favourite new feature: handles on the tops of the seats, for easy gripping as you make your way down the car. Looking down the length of the streetcar, with one of the bendy connector sections in he foreground—these feel almost exactly like the ones on the new subways. A bike strapped into the bike rack. The operator's cab, with controls, and a monitor showing feeds from all the camera doors. Cameras are mounted on the top of each door, and at the front of the streetcar facing back, giving the operator views of all doors and along the entire length of the vehicle. Allen Boyd was our operator today. Ramp request button, and passenger intercom panel. In addition to these buttons, the familiar ones are installed along many of the poles in the streetcar. The illuminated "stop request" sign; there are several throughout the car. The main portion of each panel displays warnings and notices like "watch for traffic." Presto boxes, not quite yet ready for service. Side view of the streetcar. There are three illuminated signs along the top, showing the route and destination. Difficult to read during daylight, these will likely pop out much more clearly at night. The streetcar reflected in the window of a shop, whose workers came out to check out the new ride. View from the back of the vehicle. The white "do not pass" circle flashes to alert cars when doors are open, as do strips of red lights on the sides of each doors. At night the effect may be clearer; during daylight this maybe too subtle for drivers to notice immediately. Bendy! One of the biggest engineering challenges has been designing cars that can handle Toronto's tight corners. The rear of the vehicle, showing the route and asking cars to beware. Exterior buttons on one of the centre doors will allow a passenger to request a ramp extension. Transit writer Steve Munro, taking the helm. The TTC’s new streetcars, which Toronto media got to ride for the first time today, will bring many new things to the transit-riding experience. The cars are big—huge—and riding them feels as much like being on a subway as on a current surface vehicle. With five articulating sections (“don’t lean on the bellows” warn signs on the bendy bits between each section) and all-door loading through four doors, they represent the first major investment in streetcar infrastructure in nearly two decades. But perhaps one of the most notable things these new streetcars will do is quite literally give passengers a much more expansive view of the city. The windows are, like the cars themselves, enormous—full panels that begin at seat level and extend straight up, uninterrupted by framings and handles and other doodads. It’s the panoramic view you get from a train, but of Toronto streets, and it makes for a much nicer ride. Dimensions: 30 metres long, 2.5 metres wide, and nearly 4 metres high. Rollout schedule: you’ll be able to ride the new vehicles by mid-2014 on the Spadina, Bathurst, and Dundas routes; other streets will follow, about one per year, until the full rollout is complete by mid-2018. Service: the streetcars will arrive at 671 stops on 11 routes, providing a total of 82 kilometres of service. Doors: One of the much-vaunted features of these new cars, meant to decrease the time spent at each stop, is all-door loading. Each streetcar has four doors, and payment can be made at all of them. Payment: when the streetcars first enter service, there will be a mixed bag of payment options—existing fare media (such as Metropasses and tokens) will be accepted, as will the new Presto system. Some major stops will be equipped with fare-dispensing machines during this transitional period. Eventually, the entire system will move over to Presto. Accessibility: all vehicles are low-floor and come equipped with a ramp at one door, which means that passengers using mobility devices, people using rolling shopping carts or strollers, or anyone who has difficulty managing stairs, should be able to board easily. Bike storage: each streetcar has one rack that holds two bikes. Operator booth: As with the new subways the operator gets a separate section at the front of the vehicle. Unlike the subways though, the door between the operator section and the rest of the streetcar is transparent, and there’s an intercom so you can communicate. Cameras: there are cameras mounted on top of each door, which feed into displays on a screen in front of the operator, so that the operator can check for drivers creeping up as passengers board, see if anyone needs the ramp extended, and check out traffic behind the streetcar. Infrastructure upgrades: In order to accommodate the new vehicles, the TTC is spending about $700 million to cover everything from a new maintenance facility (the Leslie Barns) to altering curb cuts and platform heights to match the new low-floor streetcars. As for how the streetcar feels: as far as we could tell under the very limited road test, it’ll be a pretty good ride. We travelled very slowly, so we weren’t able to judge how the cars will handle under real-world conditions. The turns were smooth and the ride was very quiet. If you sit directly above the trucks (the wheel units that are under the streetcar) you do notice some vibration, especially when rounding corners, but between those sections the vibrations faded significantly. There are gentle slopes in the floor to accommodate those trucks, which will take a bit of getting used to as passengers walk the length of the vehicle. One addition we really did like: the backs of many seats now have handles, so you can easily grip them for support as you walk rather than reaching for overhead poles. One of the biggest concerns raised by readers when the TTC first previewed the cars were the facing seats—they seemed a bit cramped, and the worry was that riders would start bumping knees or otherwise be forced into rather un-Canadian public interactions. Having sat in them with several other travellers, we can say that if you’re about 5’10” or under you’ll be okay; if you’re taller than that, or carrying larger bags, best to sit elsewhere. Families with children will no doubt appreciate the spaces; how strangers feel—well, Torontonians are known for being a bit uptight, so this will either lead to a lot of polite staring over your seatmate’s left shoulder, or help break the ice. Those seats, you may notice, are also a bit harder than in previous vehicles. Padding in all transit vehicles has been reduced in recent years, due to stringent new international standards: the padding adds to a vehicle’s fire load, and the new standards were introduced in the wake of several major international subway fires. The big, gorgeous windows don’t open—that’s because the streetcars all have air conditioning systems, which should be a help during August heat waves. Those windows really do reinvigorate your sense of the streetscape though—it was striking how much more open the street felt during the drive. Besides that, the streetcar’s length and width are the things riders are most likely to notice. On the test ride we took, virtually nobody was sitting down—there were a lot of standees, plus cameras and mics and all kinds of gear—and there was still a lot of room to move around. Worst case, imagine that these people, riding in actual conditions, all had bicycles or baby carriages or shopping carts—as best as we can tell, everyone should still be able to dodge around everyone else. The all-door loading should really help here, because even if you’ve got one congested part of the vehicle, the whole car won’t be blocked. Aesthetics aside though, there’s only so much pretty new vehicles can do to mend the public’s fractured relationship with the TTC. What’s far more important than the fact that there are new cars is the fact that the service plan—although there will be fewer cars than there are now—means that because the cars are bigger, the net result will be more capacity on the lines. This will come with some challenges of its own, however. The TTC is almost certainly going to discover that it has a lot of latent demand—demand they’ve been more or less ignoring for the past 20 years. Since the Spadina car opened in 1997, there’s been very little service increase on the system anywhere. The pent-up desire for better access to better service is likely to explode once these shiny new cars hit the rails. Right now, the TTC doesn’t have a satisfactory plan for accommodating this need. 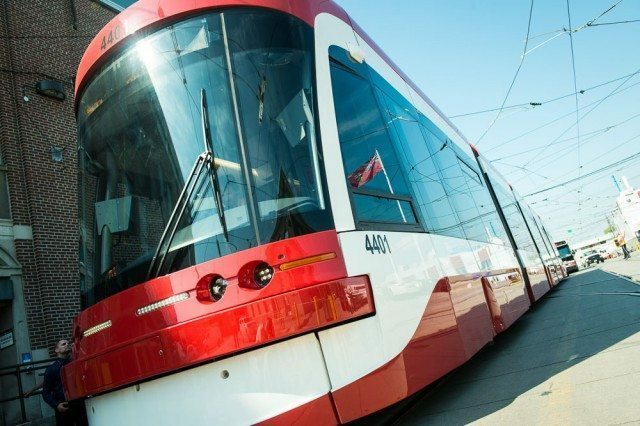 According to the current plan, the TTC wants to start withdrawing some of the existing fleet as soon as possible, after these new cars start deploying into service. Instead, they should be redeploying the older cars as the rollout of new cars occurs, so that when Spadina goes live with the brand new fleet in April, they would take the old cars that had been running on Spadina and use them to improve service on other routes that need it. That’s something that we haven’t heard a word about yet, and it’s going to be a particular issue on Queen, because the current plans are to retire the articulated (bendy) cars that run on Queen early because of maintenance problems. If the TTC doesn’t replace them right away with a lot more service…the people on Queen think it’s bad now? Just wait. There really needs to be a rethink of the whole process of rolling out the new cars, and of providing service across the whole system: even if people are waiting four or five years for their route to come up for the new cars, buying these new vehicles gives the TTC some options in terms of bolstering service across the board, since some of the existing cars are still perfectly functional. Similarly, the TTC has the potential to order and house 60 more of the new cars, though it hasn’t done so at this time. This would allow them to run the larger new cars at the same schedule as they currently maintain, rather than the reduced one they have planned. Unfortunately, it’s only once we get a transit-friendly administration at City Hall that we will stop starving the streetcar system for ideological reasons, rather than just address the fact that they are heavily-used routes that need consistently better service. Based on today’s trial run, as far as it went, we’re happy. But the real tests—in scheduling and bunching and route management and operating in real-world traffic conditions—still lie ahead.